Instead of leaving your dog behind when you go on vacation, bring your four-legged family member to beautiful Blowing Rock! Below, we’ve outlined a great one night adventure of activities and sights that are perfect for you and your pet. -Start your day off by taking a hike on one of our Blue Ridge Parkway trails! Many of our great hikes are located on the Parkway, including Linville Falls, Moses Cone Carriage Trails, Price Lake Loop Trail, and more! A great hike to look into if you want a moderate/strenuous hike is the Boone Fork Trail. Located on milepost 296.5, the Boone Fork Trail is a 5.2 mile loop trail that promises great views of meadows, ancient forests, mountains and also features a waterfall. If you want something less challenging, you can check out the Price Lake Loop Trail. This easy 2.7-mile loop circles the beautiful 47-acre Price Lake. It is a great short hike for you and your pup to explore. Note that for all trails on the parkway, dogs should remain on a leash. For more hikes around the area, visit our hiking page. -To refuel your system after the hike, head over to one of our fantastic pet friendly restaurants. Many of our restaurants offer great outdoor seating and they love for pets to stop by. If you need ideas for places to eat with you and your pet, visit our pet friendly dining page. -Next, take a stroll around downtown Blowing Rock. 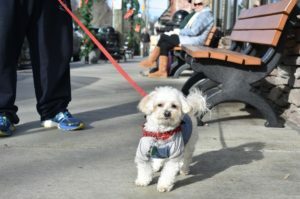 Downtown Blowing Rock is very pet friendly and we love seeing dogs on Main Street! Our store owners love dogs and many of our shops have dog bowls sitting outside to make sure you pet stays hydrated while your walking around. Make sure to stop into Stella Blue’s Pawtique on Sunset Drive. 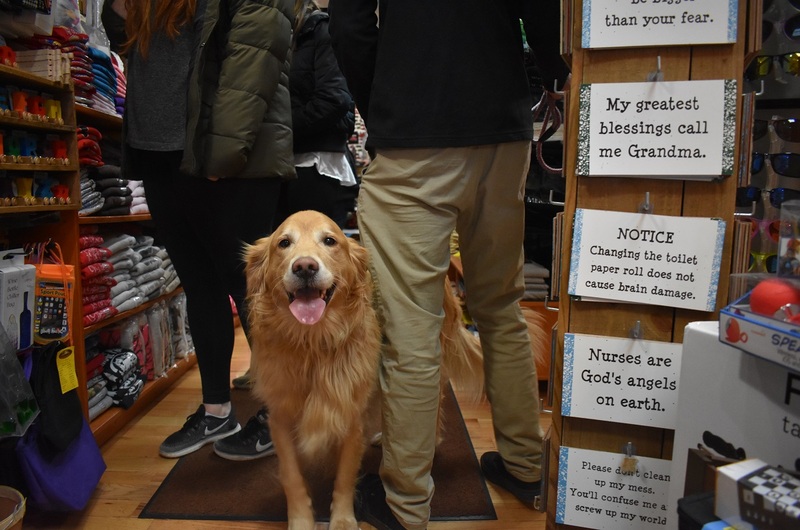 This adorable pet specialty shop is a great place to take your pet for some great new things for your four-legged friend. They specialize in dog and cat nutrition and carry the best, top of the line products, toys, and accessories. -Finally head over to one of dog friendly breweries for a beer and some food! We’re lucky here in North Carolina to have some amazing new breweries take scene in recent years. Both Blowing Rock Ale House here in town, or Appalachian Mountain Brewery in Boone have great outdoor seating and are very dog friendly! -After a long day, head back to one of our dog friendly lodging locations. We have many hotels that allow pets to stay with you during your vacation up here! Or if you decide to rent a home for a longer stay, there are many rental groups that will accommodate your pup! Click here to visit our pet friendly lodging page. -On your next day, wake up and and grab some coffee over at Camp Coffee on Main Street! They have a wonderful selection of locally roasted and organic coffees as well as great pastries to start your morning out right. You can also go to BR Bites and Brews or Blowing Rock Market for a quick breakfast with outdoor seating! -Before you make that trip back home, head over to see the Blowing Rock itself with you pup! The Blowing Rock is an immense cliff 4,000 feet above sea level. It promises breathtaking views of our surrounding mountains that will give you something to talk about to all your friend and family. Enjoy the scenic views from the observation tower and their wonderful gardens. Visible from “The Rock” are Hawksbill Mountain, Table Rock, Grandfather Mountain, and Mount Mitchell.The Blowing Rock welcomes you and your pet to explore the magical views, as long as they are on a leash and is not during a special event. -Broyhill Park- Just behind downtown Blowing Rock is Broyhill Park. You and your dog can explore the gazebo and a walking trail through beautiful gardens. -Wineries around the area– We have awesome wineries that are very dog friendly around the area! Sip on some wine and enjoy the views with your dog by your side. -Boone’s Greenway– Located in Boone, the Greenway is a great trail that is a very popular spot for dogs. -Doc’s Rocks Gem Mining – A great option, especially if you have kiddos. This gem-mining experience for you and the family can be enjoyed with you pup watching next to you! Doc’s Rocks even have animals of their own around. -Grandfather Mountain– Did you know that you can also bring your pooch to see the famous swinging bridge and great views of Grandfather Mountain? Dogs are more than welcome but must be on a leash.